"Early calls for change - away from fossil fuels - towards renewable energy." The environmental awarenes organisation NOAH was born in 1969 in Copenhagen. NOAH has local groups all over Denmark, and works with environmental issues, such as traffic policy, climate, energy, chemical hazards etc. NOAH Denmark is part of Friends of the Earth. Members were typically students, and other young people, who were concerned about the pollution of the environment, and the fate of our planet. People who wanted to work together, to make a change. Older people were also working in NOAH, an axample is Erik Kolling Andersen, born in 1920, who was an important power in establishing and running the NOAH summer camps, dealing with renewable energy and environmental questions. Learn more below. After the 1973 oil embargo, the Danish government and the electricity companies, worked for a fast adoption of nuclear power to the Danish Energy supply. The network formed by NOAH groups throughout Denmark was part of the basis for the new anti Nuclear Groups that was formed by the OOA from 1974. 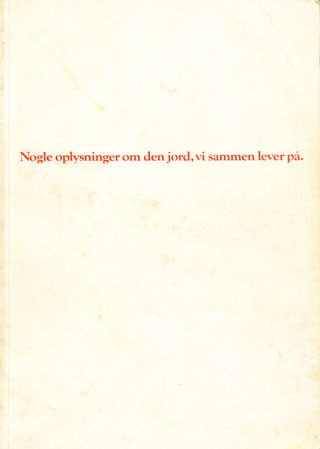 In 1970 an important book was issued by NOAH: "Nogle oplysninger om den jord, vi sammen lever på" - In English : "Some informations about the planet, on which we live together". See selected pages from this book of 140 illustrated pages, in the SLIDE SHOW. 1970 book - calling for environmental awareness. At the NOAH "Miljø-Lejr" summer camp at Rugaard beach near Grenå in 1975 - an Energy week was held. Solar water heaters, solar furnaces and a small Wind Turbine was erected in primitive surroundings. Discussions on future energy solutions were taken between NOAH acitivists and politicians from the Danish parliament. The windmill should power a refrigerator on the summer camp. We knew, that simple solutions, as presented on the camp, would not be the final solution: To convince the public that renewables held a future for mankind, we had to add professionalism to these technologies. At the 1976 NOAH summer camp at Rugaard beach, the 300 Watt NOAH Turbine should again produce electricity for the camp. This time the Turbine would be equipped with Fibre Glass blades, made by Erik Grove-Nielsen, who later formed the first Danish serial production of Turbine blades for the later emerging wind industry: Økær Vind Energi.